Do you find live departure boards full of the wrong sort of information? Would you like a clearer, more compact display? Do you want to home-in on trains to/from a particular station? The first thing to notice is that trains are listed by their origin or destination. 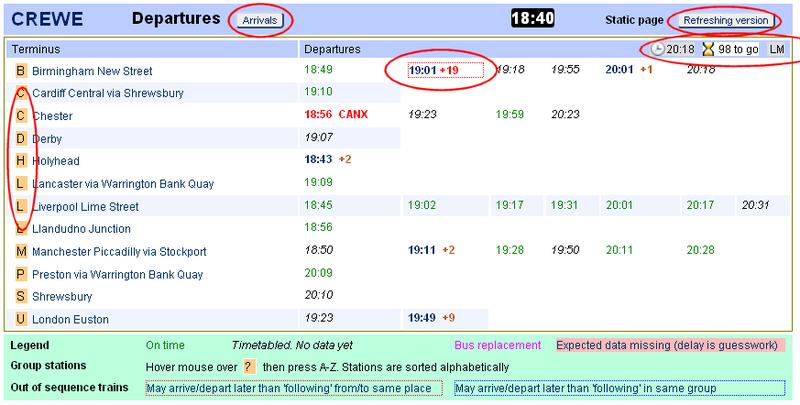 Secondly the train times are listed across the page with at-a-glance indication of how it is running. Clicking on a train time brings up the complete journey schedule and status listing. The usual options to switch between arrivals and depatrures and static and refreshing pages are easy to locate. Delays are shown with amount delayed as giving a more easily understood picture of the state of running . . .
. . . Actual expected time, minutes left until that time and operator are shown at the top right. Terminal stations can easily be grouped together (with these groups being automatically remembered for this station). For example if I frequently travelled from Crewe to Chester I might give Chester, Holyhead and Llandudno the group letter A so that they appeared together at the top of the table. The same principle can be applied to trains in the same group. If as in our previous example we'd grouped Holyhead and Llandudno together and the 18:43 was delayed say 20 minutes, then it would have a blue-dotted highlight as it suggests that it might now run later than the Llandudno at 18:56. Also remembers your favourite stations. A: Because it supports add-ins which enable me to write a program that allows me to remove the useful data from the original web page, reformat it and add other useful facilities. Q: I don't have Firefox - why should I go to the bother of installing it? A: A much nicer browsing experience customised to your personal preferences. There are 101 good reasons you should use it: In particular blocking adverts and naughty scripts, changing the look and feel, make downloading videos simple and stripping the dross from web sites to give clean pages with the information you want presented how you want it. Q: OK I'll give it a try... ...How do I get started? Install using the button at the top of this page. Then restart Firefox. Now go to realtime.nationalrail.co.uk/ldb/sumdep.aspx?T=WTM (New window) You should see the reformatted version of Witham departures. The original format is shown underneath. The first release was 26th December 2009 and is developing. It works by downloading the original NRES web page but before displaying it reads the data and reformats it.